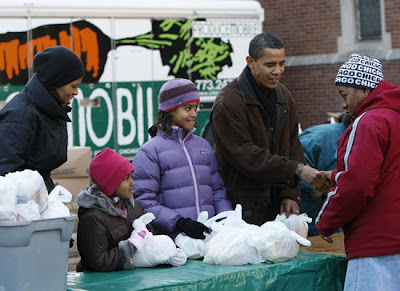 CHICAGO - President-elect Barack Obama and his wife took their daughters to work at a food bank on the day before Thanksgiving, saying they wanted to show the girls the meaning of the holiday, especially when so many people are struggling. Ten-year-old Malia and 7-year-old Sasha joined their parents to shake hands and give holiday wishes to hundreds of people who had been lined up for hours at the food bank on Chicago's south side. Sasha wore a pink stocking hat over her pigtails and Malia had on a purple striped hat as the family handed out wrapped chickens to the needy in the chilly outdoor courtyard. Those seeking food on Wednesday at St. Columbanus also received boxes with potatoes, oranges, fresh bread, peanut butter, canned goods, oatmeal, spaghetti and coffee. The president-elect, dressed casually in a leather jacket, black scarf and khaki pants, was in a jovial mood, calling out "happy thanksgiving" and telling everyone "you can call me Barack." He told reporters that he wants the girls "to learn the importance of how fortunate they are, and to make sure they're giving back." The soon-to-be first lady said the Obamas wanted to give their children "an understanding of what giving and Thanksgiving is all about." The Obama family's activities in the courtyard quickly drew the attention of schoolchildren whose windows overlooked the courtyard. They put up a sign against the glass that read: "We love our prez" and screamed when the president-elect waved to them.Obama then turned to his wife and suggested they go visit the kids. Secret Service agents, looking surprised, disappeared inside the building to accommodate his request. Minutes later, hundreds of children were brought down to the school auditorium, and Obama loped onstage as they screamed and cheered. "I just wanted to come by and wish everybody a happy Thanksgiving," he said. He then asked the children what they would be eating for Thanksgiving dinner. Turkey? Stuffing? Green beans? Sweet potato pie? Perhaps it was a hint at the planned menu for the Obamas, who are planning to host a holiday gathering at their Hyde Park home. The president-elect then took questions from the children, one of whom wanted to know what it was like to be followed around all the time. It is a topic that seems to touch a nerve in Obama, who has lamented the lack of privacy that comes with his new job. "I gotta admit, sometimes it's kinda strange ... you just want to go take a walk or go out and ride your bike or something, and you always have someone with you," Obama said. "So you don't have a lot of privacy and that's one of the things you have to sacrifice in order to run for president." B4B Note: You would NEVER see the Bush's doing something this kind for the people. What a difference ! Click if photo did not appear.